Identity, Costume, Cliché: Korean Photography Today is an exhibition by 3 talented contemporary Korean artists who share their insights to universal questions and feelings surrounding cultural identity. Together they reveal their personal experiences and opinions through projects focused on feelings of confusion, shame and embarrassment, cultural estrangement and cliché views of women. 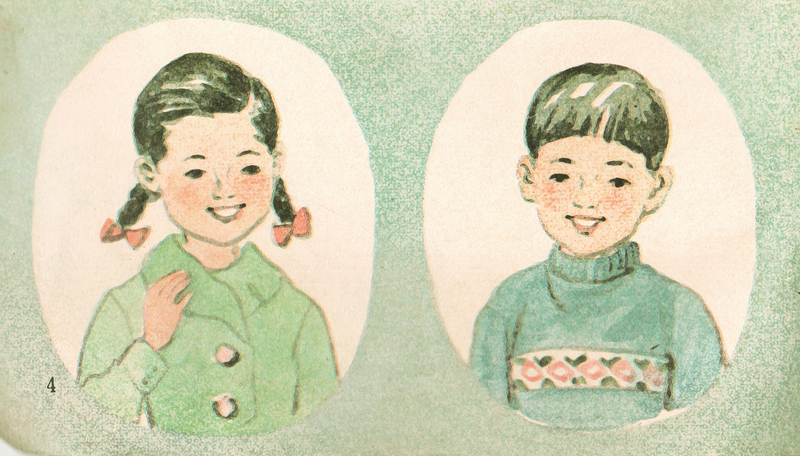 In The Text Book series Suk Kuhn Oh uses the characters of Chul-soo and Young-hee, the central characters in Korean children’s books that are similar to that of Jack and Jill. The subjects wear large masks that cover hidden emotions and explore situations that represent bizarre personal memories that many share from adolescence. In the original children’s book “The Text Book” the activities are seemingly normal – the children play with their parents and pets, or in school. In Suk Kuhn Oh‘s work he describes his act of staging as a confessional. He believes that art always has to concern people about themselves. The face, identity and representation are his main focus. He finds hidden meaning in the unconsciousness. Viewers can perceive the figure’s discomfort and distress and can remember parallel moments in their own lives of hurt, embarrassment, shame. Suk Kuhn Oh was born in Inchon, South Korea. After serving as a photographer in the Korean army, he received a degree in photography from the School of Art and Design at Nottingham Trent University in Britain. His work has been exhibited in Nottingham, Seoul, and the Pingyao International Photography Festival, and Fotofest in Houston. In the series, Existing in Costume, Chan-Hyo Bae has chosen the iconography of queenliness to express his feelings as an Asian immigrant. He dresses in period costumes and photographs himself as unidentified members of English aristocracy from the 13th to 19th centuries (all the works are untitled). His self-portraits mimic women monarchs only and are an examination of gender, power, race, and class. Living and working in London since 2004, Bae’s large format color prints reflect feelings of cultural estrangement and reveal a fantasized character that would be accepted and honored. Chan-Hyo Bae was born in Busan, South Korea and graduated with an MFA from Slade School of Fine Art in UCL (2007), London, England, and a BA in Photography from the Kyung-Sung University (2003), South Korea. Bae’s work has been shown in several international exhibitions and fairs including the London Photographic Association Awards for Portraiture, International Discoveries, FotoFest, Houston, Texas, The Alchemy of Shadow, Third Lianzhou International Photo Festival in China and The Progressive Canvas, Gallery Wa in Korea. He was in Shots Young Photographers, Shots Magazine, UK (2006), and won first prize in Art Images as Research, University College of London (2005). His work has been collected by the Museum of Fine Arts, Houston, Texas. What if a hundred clichés burst out shamelessly and simultaneously? Would we yawn or laugh at such an outpouring of banality? In the series Mirror Ball, Ok Hyun Ahn explores the idea of cliché poses of women. Contrary to how Korean women view themselves, OK Hyun asks her subjects to pose in clichéd ways that are not the norm for the women of her culture. She encourages them to strike a pose in the ways in which women have been represented in the media, the history of art and our unconscious. Ok Hyun Ahn explains “In Korea, women never strike this pose in order to be sexually appealing in their everyday lives. Even though these kinds of images are extremely familiar to most Koreans, viewers find themselves embarrassed when viewing her photographs; the clichéd images inappropriately intrude into their daily lives, and cause confusion”. Ok Hyun Ahn exposes and disturbs the cliché at the same time that she participates in its lure. Ok Hyun Ahn lives and works in Chicago and Seoul. She received a MFA in 2003 from School of Visual Arts, NY and a MFA in 1998 in Photography & Design from Hong-IK University, Seoul, Korea. Her work has been in group and solo exhibitions in Seoul, Korea, NY, NY, Chicago, IL and Tempe, AZ. In 2000, she received 2nd Sajin Bipyong (Photography Criticism) Award Prize, Seoul. She had a Residency in 2007 at Ssamzie Studio Program, Seoul.